In July, the European Parliament breaks for summer so Place Luxembourg is dead on Thursdays. Outdoor night markets, which you’ve already been attending for months, don’t mix well with your work attire. Where can you raise a glass with class in mid-summer? 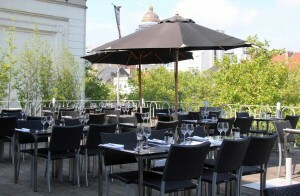 La Terrasse de l’Hippodrome is the closest thing to South Beach Miami or Ibiza you’ll find in Brussels. It’s swanky and chill with open air tables and booths surrounding a shallow pool, which ripples to pulsing electronica. The large wooden terrace upon which all sits is nestled behind a golf course and the old Hippodrome that’s under renovation. Never mind the nearby construction crane and you’ll be able to imagine the terrace overlooks a “beach” – a grassy knoll scattered with lawn chairs. Inside a covered portion of the terrace are two bars and restaurant tables. Edgy photographs of jet setters line the walls, who “oversee” service. Drinks range from champagne to well-crafted cocktails and eats go from snacks to a full dinner. There is an impressive list of wines by the glass (4-14€) as well as classic and innovative cocktails (12€) such as Cîroc Ginger (vodka, ginger beer and multi-fruit juice). Just like the beach, this annual pop-up is seasonal. So hurry over before it vanishes on 21 July, going out with a bang to Belgian National Day fireworks. No, it’s not a joke. There’s a Brussels Beach (Bruxelles les Bains). Granted, it sits next to a canal, not an ocean or lake, and it’s made of imported sand. But hey, we’ll take what we can get! 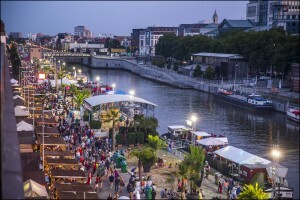 Temporarily covering part of Rue de la Dyle north of the city center, this makeshift beach turns the Brussels Canal into an oasis of fun with outdoor concerts, sports and art shows. Street vendors provide inexpensive drinks (6€) and eats. Nightlife at Brussels Beach consists of two parts: the Croisetteke, featuring a new terrace this year, and the Boat Club, a clubbing cruise (5-12€) on the canal with a DJ and drinks. There’s also live music on the weekends and film screenings some nights at 10 pm. Plan now as everything is only open until 9 August. Crystal Lounge in the Sofitel Hotel on Avenue de la Toison d’Or sparkles indeed with its after work cocktails and live music on the second floor rooftop. The scene instantly takes your mind from the office to luxury. The enclosed terrace shelters you from the sound of traffic and sight of anxious commuters. Cocktails are imaginative (albeit a pricey 17€ each given the hotel locale) with unusual ingredients, which are accompanied by fun snacks. There’s even a surreal Magritte Cocktail (dark rum, orange juice, tonic and rosemary) featuring sides with darkling beetles, butterfly-shaped toast and a skewer of roasted catepillars! Now don’t fear as innovation in all other cocktails is not based on insects. A more typical example is this month’s featured cocktail, Life is Better on a Terrace (dry sherry, orange liqueur, lime and apple juices, coco syrup and blue Curaçao). Substantial food offerings range from tapas to multi-course meals are available should you stay for sunset. And should it rain without warning, as is often the case in Brussels, there’s an inside bar just steps away. But indeed, summer life in the city is better on a terrace. 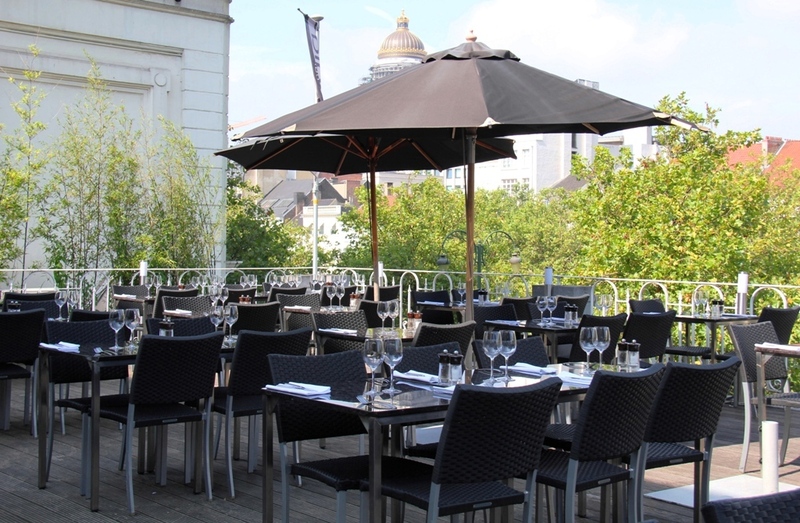 Nearby Cospaia is a bit clubbier than Crystal Lounge with a large terrace overlooking Avenue de la Toison d’Or near Porte de Namur. Its tag line, “where mystery meets gastronomy,” is enough to lure one in. But the second floor terrace and excellent cocktails (11-14€) will keep you coming back. A French-dominated wine list is also quite impressive (6-12€ by the glass). It pairs well with the French-Belgian cuisine of Cospaia’s restaurant. Three-course fixed price dinners or a la carte dishes are available should you stay beyond Happy Hour. 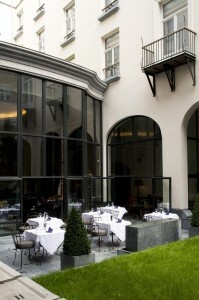 The courtyard features an extensive cocktail and wine list. There are both classic cocktails such as the Mint Julep and original creations like Saffron Smash (saffron gin, Benedictine, orange liqueur, lemon juice and mint) for 11-14€ each. Wines by the glass average 7.50€. Reasonably priced “bits and nibbles” have a French flair and expensive dinner options are international. Given that the sun is shy in Brussels, taking advantage of summer weather here is a must. 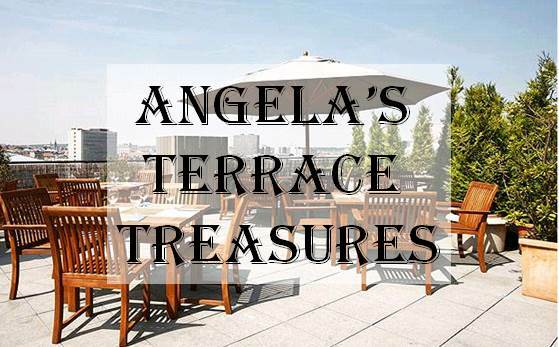 These terrace treasures are among the city’s best for soaking up some rays and bevvies. Angela Dansby is a foodie public relations pro and freelance writer on all things fabulous (food, wine and travel) based in Brussels.